Bing, Dengjin. "Pea". The Canadian Encyclopedia, 01 June 2015, Historica Canada. https://www.thecanadianencyclopedia.ca/en/article/pea. Accessed 18 April 2019. Some pea cultivars are grown in gardens for their tender green pods as VEGETABLES, which are harvested at their early stage of development, and eaten raw or cooked. They are known as snowpeas, sugar peas or snap peas. In parts of Asia and Africa, tender pea foliage is harvested as vegetable. 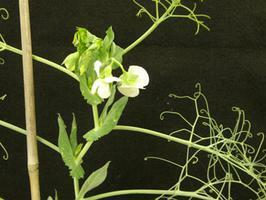 Pea with white flowers (courtesy Dengjin Bing). Normal leaf pea (courtesy Dengjin Bing). Pea with purple flowers (courtesy Dengjin Bing). Semi-leafless pea (courtesy Dengjin Bing). Peas are members of the Fabaceae (formerly known as Leguminosae) family. Cultivated peas belong to the species Pisum sativum. Although their exact origin is unknown, it is most widely accepted that peas originated in northwest Asia, spread to the temperate zones of Europe, and from there spread to other parts of the world. Peas are now grown and used worldwide in a variety of ways. Some pea cultivars are grown in gardens for their tender green pods as vegetables, which are harvested at their early stage of development, and eaten raw or cooked. They are known as snowpeas, sugar peas or snap peas. In parts of Asia and Africa, tender pea foliage is harvested as vegetable. Peas are also grown as a forage crop in a mixture with cereal crops to improve the protein content and reduce the fibre content of harvested forage. However, the majority of peas are grown for their grains, which are harvested either as immature or dry mature seeds. When harvested in an immature state, they are exclusively used in food as a fresh vegetable, or are canned, dehydrated or frozen. Dry mature seeds are used as animal feed or as food in whole or split form. Pea seeds are processed for their components of flour, starch, protein, and fibre and used as an ingredient of a variety of food or industrial products. Peas were introduced into North America by early European explorers at the end of the 15th century. In Canada, indigenous people were growing peas in the Montréal region in 1535. Both garden and dry peas (commonly known as field peas in Canada) are grown in Canada. Garden peas are mainly produced in Ontario and Québec, whereas the majority of dry peas are produced in western Canada. Dry peas have been grown in western Canada to a limited extent since the early 20th century. The rapid increase of dry pea production in this region started in the mid-1980s. This augmentation was driven mainly by the increased export of dry peas to the European feed pea market, and by the higher net economic return to growers from dry peas than from red spring wheat. Increased emphasis on crop diversification and crop rotation, and rising value-added processing such as protein or starch fractionation (ie, the biochemical separation of pea seed components) also contributed to this boost in pea production. Since 1998 Canada has been the largest dry pea producer and exporter in the world. The average harvested area of dry peas in Canada is over 1.2 million hectares. Currently dry peas represent the fourth or fifth largest field crop of Canada after wheat, barley, canola or oats. The majority of dry peas in western Canada are produced in Saskatchewan, followed by Alberta, Manitoba and British Columbia. 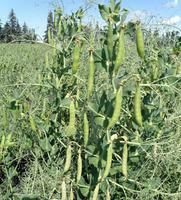 Several types of dry peas are currently grown in Canada including yellow, green, marrowfat and maple peas. Yellow and green peas predominate in Canadian dry pea production, and they are grown for food or feed market. The other two types are produced in much smaller quantities. Marrowfat peas have large flattened green seeds, which are popular for making snack food items, and also for reconstitution and canning. Maple peas usually have smaller seeds than yellow, green and marrowfat peas. Seeds of maple peas contain higher levels of tannin, and are primarily used for bird feed. Yellow, green, marrowfat and maple peas are all spring types. They are seeded in spring and harvested in fall. Austrian winter peas, which have similar winter hardiness to winter barley and can be seeded in fall or spring, could be produced in Canada. The seeds of traditional Austrian winter peas usually have a grey colour with purple or brown mottles. They are usually smaller in size than the seeds of yellow, green and marrowfat peas. There is no commercial production of Austrian winter peas in Canada at present. Limited studies in western Canada have shown its potential and adaptation to certain areas in western Canada. Currently, two cultivars of Austrian winter peas are registered in Canada. Many morphological variations exist in peas. Some have normal leaves. Others are semi-leafless. Early dry pea cultivars have normal leaves. This type of cultivar is prone to lodging (ie, falling down onto the ground), and difficult for machine harvest. The majority of modern cultivars are semi-leafless and have much better lodging resistance than normal leaf cultivars. 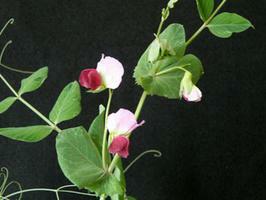 Some dry pea cultivars have white flowers, and others have red or purple flowers. These morphological characteristics are often used to identify different cultivars.